Looking for deals in Marrakesh? Offering a restaurant and a swimming pool, Hôtel & Ryad Art Place Marrakech is located in Marrakech. Free WiFi access is available. Each room here will provide you with air conditioning and a... Location was excellent, right in the middle of Jama al Fnaa. Rooms were quite and clean. Four Seasons is a 3-minute drive from the Menara Gardens. It offers an outdoor swimming pool surrounded by palm trees, sunbeds and a rooftop terrace. A wellness center and free Wi-Fi are available. Excellent! We travel extensively - and this is one of the best places we have ever seen. Beautiful property and wonderful service. This luxurious boutique hotel sits in a beautiful 3-hectare landscaped park in Marrakech. What dio d we like?... the personal touch from the staff who were all very friendly. Offering an outdoor and indoor pool, Royal Mansour Marrakech is located in Marrakech. The property is 1.2 mi from Bahia Palace and a 5-minute walk from the famous Djemaa El Fna square. Everything from check in to check out was just superb. An experience we will always treasure. Located in the tourist center of Marrakech, this luxurious club hotel features 2 swimming pools, 2 tennis courts and a fitness center. The spacious rooms feature a balcony and a mini-bar. Gorgeous hotel, staff were lovely, friendly & attentive, nothing was too much trouble. This luxury hotel is located in a 10-acre park in Marrakech, just 10 minutes driving from the Jamaâ el Fna Square. Location, Rooms, Pool, common areas and overall beauty. Located in Marrakesh, a 19-minute walk from Koutoubia, Riad Glamour has air-conditioned rooms with free WiFi. Featuring a 24-hour front desk, this property also provides guests with a terrace. The riad is very nice and characteristic and the staff very nice and helpful. This hotel in the Palmeraie district features an outdoor swimming pool and a spa. Free Wi-Fi internet access is provided throughout the property, and Marrakech Airport is 11 mi away. Staff were very helpful and friendly. Offering a pool and a restaurant, Yaad City Hotel is located in Marrakech, 2 minutes' walk to Majorelle Gardens. Free WiFi access is available. The staff were very friendly and super helpful! Offering an outdoor pool, Résidence Al Ounss is located in Marrakech. The property is 2.5 mi from Bahia Palace and 0.6 mi from Majorelle Gardens. Free Wi-Fi is available in all areas. Staff was very friendly and helpful in each way. Four Seasons is a 3-minute drive from the Menara Gardens. It offers an outdoor swimming pool surrounded by palm trees, sunbeds and a rooftop terrace. A wellness center and free Wi-Fi are available. Excellent! We travel extensively - and this is one of the best places we have ever seen. The Naoura Barrière is spread over a beautiful garden landscape, centrally located in Marrakesh near the heart of the medina. It offers a peaceful setting and luxury facilities. The location was nice, very good facilities and staff very friendly. Hotel Du Tresor is in the heart of Marrakech, a 5 minute walk from the famous Djemaa-el-Fna Square. It offers rooms in a traditional Riad with free Wi-Fi internet access. one of the nicest places I've ever stayed at. The Pearl Marrakech features a rooftop swimming pool, 3 restaurants and a lounge bar with an art gallery. 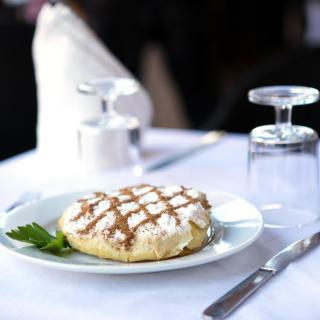 Great Moroccan Breakfast with a big variety of dishes to choose from. Which hotels in Marrakesh are good for couples? These hotels in Marrakesh are highly rated by couples: La Maison Arabe Hotel, Spa & Cooking Workshops, Royal Mansour Marrakech, and Riad Zouina. What are the best hotels in Marrakesh near Menara Airport? Travelers who stayed in Marrakesh near Menara Airport (RAK) have said good things about Four Seasons Resort Marrakech, Savoy Le Grand Hotel Marrakech, and Sirayane Boutique Hotel & Spa Marrakech. How much does it cost to stay in a hotel in Marrakesh? On average, 3-star hotels in Marrakesh cost $50 per night, and 4-star hotels in Marrakesh are $81 per night. If you're looking for something really special, a 5-star hotel in Marrakesh can be found for $222 per night, on average (based on Booking.com prices). Which hotels in Marrakesh are good for families? Many families visiting Marrakesh loved staying at Royal Mansour Marrakech, Riad Zouina, and La Maison Arabe Hotel, Spa & Cooking Workshops. Which hotels in Marrakesh have nice views? Fairmont Royal Palm Marrakech, Es Saadi Marrakech Resort - Palace, and Tigmiza Boutique Hotel & Spa got great room view-related reviews from travelers in Marrakesh. Which hotels in Marrakesh offer an especially good breakfast? For hotels in Marrakesh that serve highly-rated breakfasts, try Royal Mansour Marrakech, Riad Zouina, and Selman Marrakech. 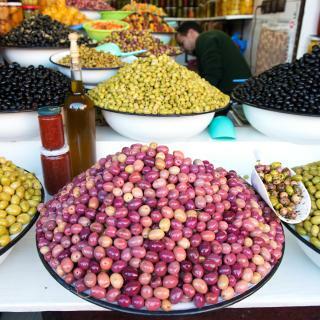 Which neighborhood is the best one to stay at in Marrakesh? Medina, Hivernage, and Gueliz are popular with other travelers visiting Marrakesh. How much is a hotel in Marrakesh for tonight? On average, it costs $47 per night to book a 3-star hotel in Marrakesh for tonight. You'll pay around $77 if you choose to stay in a 4-star hotel tonight, while a 5-star hotel in Marrakesh will cost around $351, on average (based on Booking.com prices). What are the best hotels in Marrakesh near Djemaa El Fna? Some of the best hotels in Marrakesh near Djemaa El Fna include Riad Les Nuits de Marrakech, Dar Andamaure and Gem Riad. How much is a hotel in Marrakesh for this weekend? The average price per night for a 3-star hotel in Marrakesh this weekend is $94 or, for a 4-star hotel, $161. Looking for something even fancier? 5-star hotels in Marrakesh for this weekend cost around $999 per night, on average (based on Booking.com prices). Which hotels are the best ones to stay at in Marrakesh? 2Ciels Boutique Hôtel, Les Jardins De La Koutoubia, and La Maison Arabe Hotel, Spa & Cooking Workshops are some of the popular hotels in Marrakesh. 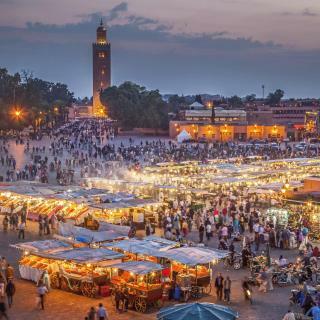 Situated in the northwest African nation of Morocco, Marrakesh is a stunning labyrinth of colorful markets with traditional goods and exotic aromas. Wander around the vibrant alleyways and meet snake charmers, acrobats, and musicians. The Medina is the historic district of the city and a UNESCO World Heritage Site hosting numerous monumental buildings. Fill your senses with smells, sounds and sights that you will never forget. 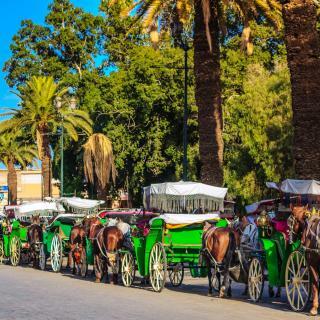 Djemaa El-Fna is one of the most popular squares in Africa and here you will find an array of regional spices, argan oil, leather products and traditional clothes. During the night there are big white tents offering delicious specialities such as tajine, couscous, brochette and soups - a taste sensation. Famous for its hammam treatments, Marrakesh has a selection of places where you can relax in a traditional steam room or enjoy a soothing massage. 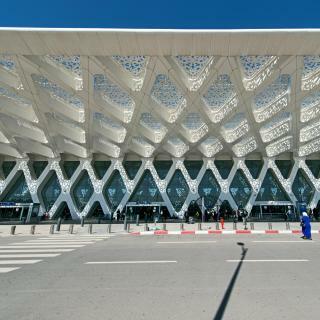 Marrakesh Menara Airport is one of the largest in Morocco and the airport’s new extension combines modern elements with the most ancient architectural traditions of the area. Booking.com has a broad selection of Marrakesh hotels, apartments, and villas for every taste and budget. Compare to other tourism cities in Morocco, Marrakesh is too commercialized and peddlers there are less friendly and respectful. Don’t try any food at Jemma el-Fnaa, expensive and probably defraud you! 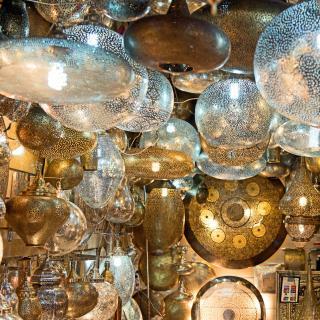 Marrakech is very cosy with its souks, local shops and craftsman working in front of you right there in the shops. Camel ride is a must do. Visited museum de Marrakech, which is worth 30-40 minutes to spend. Couldn’t do much in the desert or mountains with the small kids. But overall nice experience for not more than long weekend-max 5 days trip. Very beautiful city! You will need at least 2 days there! Pollution though is horrible! Motorcycles are everywhere and you can’t even cross street without someone trying to run you over! Food and views are the best things about Marrakesh! If you come from different city make sure to wear very comfortable shoes and fluffy clothes otherwise it might be very hot and walk there is very long!!! Magical city. I don't recommend if you have never travelled. This is a country you may not enjoy unless you have traveled around the world a bit. The people were very friendly. The food is delicious. Marrakesh is a lovely city and had a blast, the markets are amazing! It can be overwhelming at first but after a day or two getting around is easy and fun. Suggest going with a group or solo however a female solo just needs to be a little careful if anyone asks you for a romantic time. Morocco is friendly and very welcoming - the people generally have a great sense of humor. The property is absolutely gorgeous and it has everything a 5 star establishment offers including a Spa but in a more intimate setting of a boutique hotel. You really get the feeling of a warm home while simultaneously offering the backdrop of a palace. Service from all the staff I encountered especially Issam were a genuine gesture of hospitality. All these qualities are markers for a guaranteed memorable experience. My Spa experience also was incredibly professional and well tailored to fit my needs and preferences. Rooms are ok and the outside areas are nice and comfortable...it might be a 5 star hotel for morroco standards but don’t expect 5 stars luxury here....I have the worst things say about this place, specially about reception staff but I have to say I word about restaurant staff, some of them very very nice and friendly and security staff wich in the middle of so much problems and with the must stupid and rude managers I’ve ever seen they were abble to keep calm enough to avoid bigger problems. amazing hostel. brand new. food was best I had in Morocco. exactly as shown in photos. lovely owners and super nice staff. so lucky to have been one of the first to stay here. FYI the google maps location is CORRECT. the door is a bit hard to find, as most things are in the medina- and the local kids like to tell you wrong and ask for money for showing you other places. but don’t let that deter you. loved it here. for the price, and traveling solo or on budget - perfect. Choosing this hotel was our excellent choice. Very nice and polite English speaking staff, absolutely spotless and clean room, walking distance to the main square Jemaa el-Fna, but still away from all the noise and upsetting crowd. Recently renovated, and constantly improving the yearly rate on Booking. We used luggage storage as we went in the desert for two days. One of the best places we stayed during our 3 weeks trip in Morocco. The staff here were so friendly and helpful. The entire hotel was impeccably decorated and clean with a modern but classic vibe- I couldn’t believe how nice it was for the price! The food was AMAZING- some of the most delicious food I had in Morocco. Don’t bother eating out. Just relax and eat here every night of your stay. It’s so good! Really nicely renovated Riad. This is a oasis of quietness (which is nice after spending a few hours in the thrilling Médina). The staff was so friendly, always smiling and very helpful and insightful about Morocco. The roof terrace was another great space to relax. And the dinner we had there was one of the best of our entire trip! Amazing place, one of the best i have been. Suites are fantastic, well accesoriated and with everything you need. Dining in the patio is like living in a dream. The staff is VERY AWESOME, there for everything you need, better than many 5 star hotels. Pay a little more to stay in this place and you won’t regret it. This Riad is a dream! Perfect location, beautiful room cleaned every single day, nice breakfast and unbelievable rates plus very nice and helpful staff. We booked this hotel after I read about it on a travel blog and I cannot recommended enough. I would give more than 5 stars is possible. Went with high expectations based on previous reviews. They were surpassed. Attention to detail allied to welcoming staff, comfort and a quality finish sets a standard that many 4/5 star hotels can't match. Happy to recommend. Location was fantastic! Management was attentive, knowledgeable and friendly. An added bonus was leaving a bag with no problems at the hotel while we travelled to other parts of Morocco. Would highly recommend this place! I really enjoyed the food there, and the landscape were just amazing!! It takes only 2 hours from Marrakesh and you will find yourself in a totally different place. for sure it will be one of my highlights in Morocco. Location Only, its an 80's 5 star hotel. dont expect a fancy building and facelities. if like thees days 5 star hotel, this s not your right option i guess. it needs renovationg for sure. Very friendly hosts. 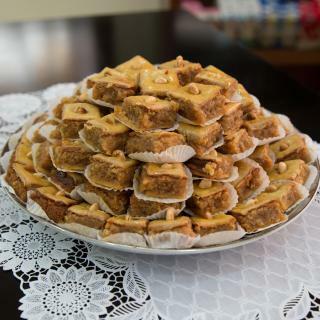 The best breakfast we had during our two-weeks Morocco trip. Rooms are very clean. Location is just right in the Medina, everything in walking distance. Very clean, great atmosphere. Would give this 5 star hotel a 4 star review. It lost one star for inconsistent food. And overpriced cocktails. Well located. Familiar but still a 5 star hotel. Staff super kind. Everything from check in to check out was just superb. An experience we will always treasure. The staff was so polite and professional, yet made us feel at home. Food was amazing, the spa was great! If you can afford it, I highly recommend this place and I look forward to going back soon again.